I’ve been meaning to write a review of a Fritz Lang movie for a while now. The great German-American director had a career full of brilliant classics like “Metropolis” and “M” and lesser-known, but equally influential, noirs. I was particularly interested in doing an Iceberg Arena comparing “Dr. Mabuse” (1922) and his underappreciated “Spies” (1928), both epic-length silent gangster serials that helped pave the way for modern thrillers and action films. I might still do that, but after recently watching “Secret Beyond the Door,” I’ve been moved to speak out in favor of this so-called “minor” picture, not the least because I was so annoyed by the negative AllMovie review. The aforementioned review begins by saying, “Even star Joan Bennett and director Fritz Lang regarded The Secret Beyond the Door as the weakest of their collaborative efforts” referring to the four films “Scarlet Street,” “Woman in the Window,” “Man Hunt,” (which I haven’t seen, so except in from my next statements) and “Secret Beyond the Door.” On some levels, I can see how “Secret,” when considered in such company, deserves its lesser reputation: it has the most unpolished script, the most experimental narration, the strangest setup, arguably the most dated psychology and easily the worst ending. Yet it’s my favorite. Perhaps my newfound love for it stems from my bias towards good premises. I tend to give extra points just for creativity regardless of execution. It’s not that I found the delivery in “Secret Beyond the Door” to be lacking, but it sheds the conventional restraint and dignity of oscar-winning “prestige” pictures. Joan Bennett plays Celia, a flighty NYC socialite who’s slipped out of every relationship she’s ever been in and finds herself vacationing rather aimlessly in Mexico. There she meets an enigmatic architect (Mark Lamphere played by Michael Redgrave) while staring with undisguised fascination at an impromptu knife fight. Her narration ensures us that she is eminently in control of the budding relationship as she falls quickly and deeply in love. But Mark has many, many secrets. Celia arrives at his brooding estate to find the master of the house absent, but surprise (! ), Mark has a creepy precocious son, David, by a previous marriage. And he has an tyrannical sister. And he employs a secretary/nanny who hides a hideous facial burn scar. And he has six rooms transported from around the world, grafted onto his mansion and preserved in the exact state they were in when a notorious psychosexual murder (always with a female victim) took place! And there is another room. A room with nothing but a single 7 adorning the door. A locked door. A door which Mark says must never, never be opened. A door beyond which lies a terrible secret! Come on! If that isn’t awesome, than neither is Jean-Claude Van Damme trying to stop a terrorist plot to destroy America with exploding designer jeans (see “Knock Off”). Fritz Lang’s story is not only impossibly weird even by his own eccentric standards, but it’s so full of mentally fraught psychoses and rapid-fire red herrings that I could hardly keep up with its impressions and implications. Usually I get pretty sick of Freudian mumbo-jumbo, but here the sheer excess sports an unmistakable satiric grin. I can’t be the only one who watched this movie and saw a certain amount of skepticism and exasperation with psychology clichés about overbearingly-matriarchal, trauma-filled childhoods that somehow explain away the complexities of the adult world. Sure, Lang hangs his resolution on exactly these tenets, but everything from the foreshadowing sardonic pop-psychology suggestions of a snobbish party-goer to the ridiculously over-the-top intersection of multiple climactic psychological revelations in the finale, testifies to a directorial touch more akin to ironic showmanship (a la the Coen brothers) than pure naivety (William Wyler). As for the script, the overt psychological foregrounding does lend the film the type of imbalances that get English teachers and studio producers alike wagging their fingers. For one thing the narration overpowers the spoken dialogue, sticking to Celia for 95% of the film, but somewhat inexplicably switching over to Mark for a single scene before returning to Celia again. The script indulges in some extreme melodrama, giving cataclysmic emotional weight and accusatory music-enhanced drama to everything from a vase of lilacs or a missed train connection to a knife fight and David’s deadpan insistence that Mark murdered his mother. Though wholly removed from reality, and even traditionally movie-land exaggeration, I’d have to argue that part of the proof [of quality] is in the pleasure. Like a Douglas Sirk melodrama (but in shadow-laden gothic B&W rather than Technicolor candy-shop hues), the frenzied tone and heightened emotionalism unchain irresistibly watchable inner demons and display an artistry unfathomed by safe “A-movie” directors. Yet I don’t even think “Secret Beyond the Door” need restrict its audience to the cultish niche for bizarre, but otherwise unimpressive thrillers. The writing shows not just audacity, but remarkable plotting and efficiency. I always love when a writer can squeeze double duty from a single idea, making an object or a piece of information fit comfortably in its first appearance and then bringing it back when you least expect it. An example might be a western where the villain uses a strategically placed mirror to cheat the hero at cards, but at the end of the film the same mirror serves to reveal to the hero that the villain is hiding behind the bar. A poor example (which I know you’ve seen before) is when a character just happens to mention that their sleeping pills, when taken in large doses, work as a colorless, odorless, untraceable poison. Hmmm… I wonder if and how that will come up later? Celia cuts the bottom off a candle to make a wax print of Mark’s secret key. There is some tension when Mark notices the sudden change in candle height, but otherwise we have no reason to expect the incident to serve any purpose other than getting a copy of the key into Celia’s possession. However, Lang gets one of his best and most chilling twists out of an unexpected return to this event. Another conspicuous achievement of the script is the even-handedness with which it treats the characters. Lang has a history of presenting sympathetic criminals and corrupt pillars of society, but rarely has he spread the uncomfortable quirks and fatal flaws so thickly over an entire ambivalent cast. Mark, though honestly in love, is textbook Hollywood-style crazy. His son appears to be a morbidly-fixated Asperser’s syndrome patient. His sister effectively manages the estate, but power-binges and has a strange relationship with her brother that combines maternal, paternal and sadistic impulses. The nanny is obsessively attached to Mark, whose life she once saved, and both the presence and non-presence (don’t ask) of her scar send her into a series of physical tics and mental terrors. Celia herself is presented as having commitment problems, emotional insecurity and a clear death-wish that struck me as sexual in nature. (You can see my point about how pervasive and over-the-top this is even compared to Freud-lovin’ Hitchcockian thrillers). With all this, it really is quite difficult to tell who is good or bad; dangerous or just off-kilter. So having made a case for the script, I’m not really sure what still needs to be said. The acting from Joan Bennett and Michael Redgrave is in top-form and perfectly modulated to the nourish atmosphere. That goes without saying for some, but the co-stars aren’t really household names these days and many of their films are slipping from underrated (I know Molly shares my love of Redgrave in “The Quiet American”) to forgotten. Meanwhile, the visuals straddle the line between Lang’s monumental masterpieces and his low-budget quickies, occasionally gifting us with the Expressionism of his home-country (see the poster art at the top of this review). He saves most of his oblique angles for the bold shadows that tear through the frame, upset the pleasant wholesomeness of the manor and generally covering the essential minimalism of the sets. He puts his camera just where it needs to be to make us feel in danger, yet just far enough to make us lean into the fear, be it to see the expression on the face of a woman proud to have instilled murder in her admirers or to catch a possible tinge of blood in a sealed-off crime-scene. One of my favorite shots looks down on a party at Mark’s manor as rain spoils their vapidity and the narration snipes at their hastily retreating forms. Find an excuse to see this film. 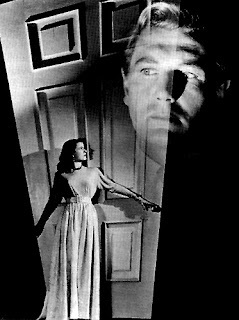 Fritz Lang, film noir, gothic horror, my review, whatever gets you excited about it. If you haven’t seen other Lang features, take a detour to round up his uncontested greats, but do give this a chance even if you have to find it on VHS (no DVD version yet) or watch it on TCM. Let’s get this out of the cult niche.